I got quite a number of autographs at the First Annual Minnesota Sports Holiday Show back in December, but only three of those signatures were on cards. The first two, Dave Osborn and Rickey Young, have already been written about. 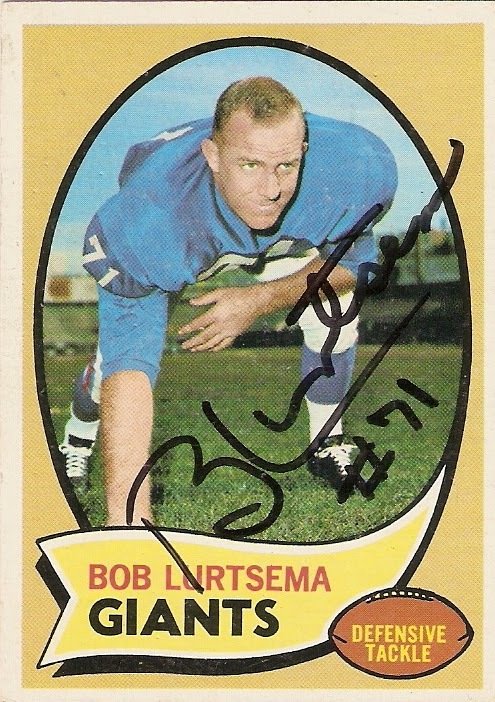 The third was Bob Lurtsema, who signed this 1970 Topps card. 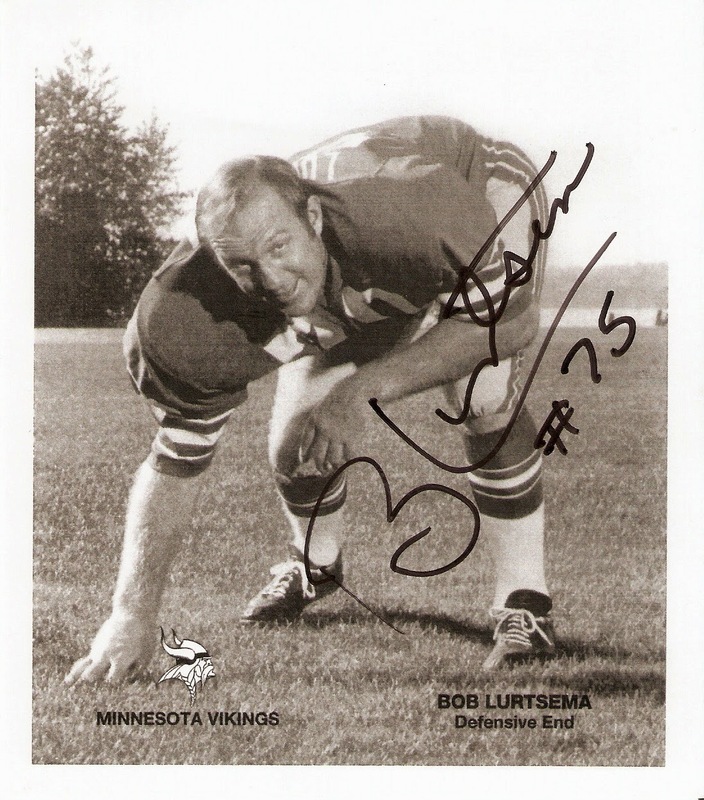 Lurtsema wasn't the most prolific player on the field, but his personality endeared him to football fans all over Minnesota, where he played for six years of his 11-year career, playing in two Super Bowls during that time. When his playing career was over, "Benchwarmer Bob" appeared in TCF Bank commercials and owned Benchwarmer Bob's Sports Cafe, which had two locations in the Twin Cities. He would later enter the world of professional wrestling with the AWA, first as a biased referee, most notably taking the side of The Trooper in a match against Mike Enos. He would later enter the ring as a competitor at AWA Twin Wars '90, teaming up with The Trooper and Brad Rheingans to defeat Tully Blanchard and the Destruction Crew (Mike Enos and Wayne Bloom). I must say, of all the signers at the show, Lurtsema was having the most fun. He was constantly getting up to take pictures, talking across the room with the other signers, and even pulled me out of line to bring me to Lou Nanne's table when he saw I was wearing a Minnesota North Stars hoodie. He also brought his own photos to sign and give out to all who wanted one, which was great, because it allowed me to at least have one signed item of his as a Viking. If you look at the two, you can also see that he wrote different jersey numbers on the two items, to correspond with the jersey number he was photographed in on the item, which was really cool.